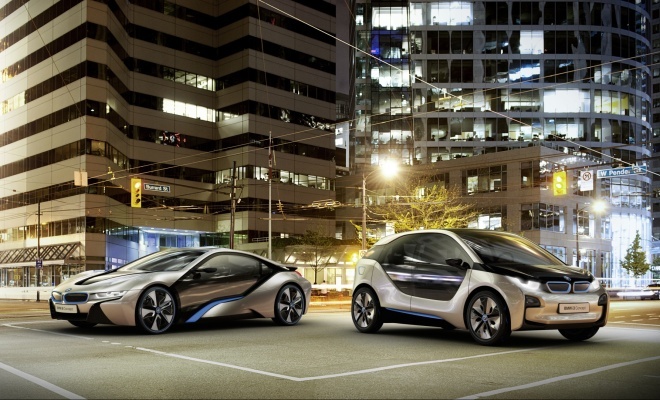 Late last week, BMW unveiled further details of its two upcoming “i” cars, the i8 plug-in sports hybrid and the more modest i3 electric urban vehicle. 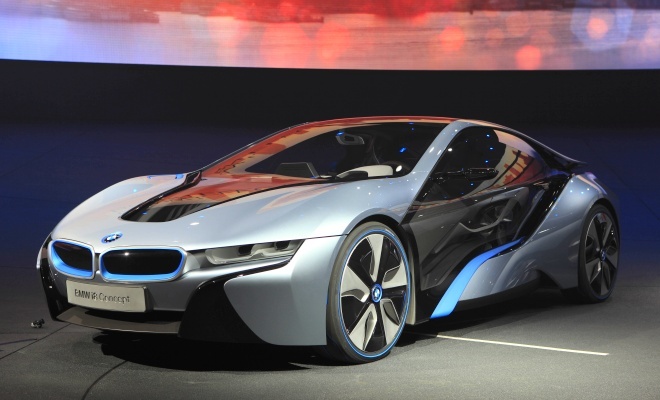 It also showed off the latest concept versions of the two cars, giving heavy hints about how they will look when the pair go on sale – as early as 2013 in the case of the i3, a year later for the sleeker, faster car. I can’t help but be more interested in the i3 than i8 - the more practical car is surely the one destined to sell in greater numbers and to define what BMW is getting at with its i-vision. We’ve seen the i3 in swirl-camouflaged action before, so we knew it was a stubby, snub-nosed vehicle with a great stance, courtesy of a big wheel at each corner. Now the swirls have been removed, revealing an arresting combination of painted carbon fibre bodywork together with translucent door skins and a transparent hatch. As was hinted by previously released images of a crash-tested chassis, there’s no B-pillar between the front and rear passenger doors, with the back pair opening in rear-hinged Rolls-Royce fashion. Inside, there’s no transmission tunnel so the floor is completely flat – a boon for passengers in the i3’s target urban environments, where you don’t always want to step out into busy traffic. Shuffling across from one side of the interior to the other is kept simple up front by the absence of any kind of centre console. The carbon body sits atop an aluminium skateboard chassis, which sites the substantial lithium-ion battery under the passenger compartment floor. Riding in the i3 will no doubt feel akin to climbing aboard the original Mercedes A-Class, which featured a similar sandwich floor that imbued an unusual high-up but laid-back seating position. BMW suggests that the driver’s eyeline will be higher than in ordinary cars but lower than in most 4x4s. The under-floor battery is liquid cooled (or, in winter, heated) and can trade warmth with the heating and ventilation system for greater efficiency. BMW hasn’t said how big the battery is, but given that it quotes a six-hour recharge from a 240V socket, it’s safe to assume that the i3 holds around 18kWh. Clean aerodynamics and a relatively low 1,250kg kerb weight give the i3 a practical driving range of 80 to 100 miles, according to BMW. Top speed is capped at 93mph in the interests of range, but acceleration is suitably BMW brisk. The rear-mounted motor offers up peak power of 125kW (170bhp) and 250Nm (184lb-ft) of torque, sufficient for a sub-eight-seconds 0-62mph time. The tyres are unfashionably narrow, but tall rims maintain a large contact patch for good grip. Rear drive should give the i3 communicative steering and, perhaps more usefully around town, a tight turning circle. The rear-mounted motor, differential and control electronics do eat into boot space, which is a tight 200 litres. There is extra storage under that stubby bonnet, however, given the lack of an engine. 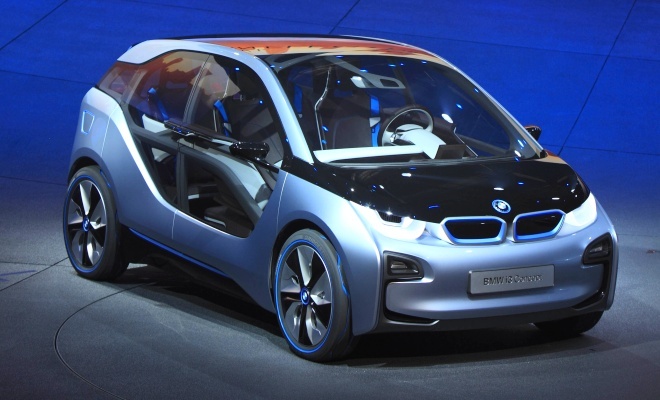 BMW has confirmed that it will offer the i3 with a range-extender option, which it dubs REx. Few details have been revealed, except that the small engine charged with generating on-the-spot electricity won’t go into the above-mentioned slot under the bonnet. Instead it will nestle at the rear alongside the drive motor. For those who prefer not to carry around a spare engine, there will be two optional driving modes designed to make precious electrons go further. Eco Pro mode will soften throttle response to enforce gentler acceleration, coupled with a user-selectable speed cap that can be set between 56mph and 70mph. A step further is Eco Pro+ mode – a kind of get-you-home option for those sweaty, range-anxiety situations where the projected range and the actual distance to a charging point look worryingly similar. It shuts down every non-essential ancillary (safety systems aside), engages a super-soft throttle response, and limits top speed to 56mph. Among the safety systems is Proactive Front Protection, designed to scan the road ahead and capable of warning the driver in good time before a potential collision. Below 37 mph, the i3 should detect pedestrians as well as more solid objects, and in addition to warning the driver can perform an emergency stop to avoid a sickening wet thump. A useful Traffic Jam Assistant is also on the cards. It’s an urban cruise control system, available at up to 25mph, that will maintain distance and also steer the car between white lines on the driver’s behalf – but only if the driver can be bothered to keep at least one hand on the wheel. Less impressively, BMW continues to pursue its notion of one-pedal driving, whereby substantial regenerative braking arises as soon as you lift off the throttle. The i3 will apparently slow down at a rate equivalent to light braking in a conventional car (illuminating the brake lights in the process) if the driver’s foot isn’t actively pressing the throttle. The brake then becomes a rarely-used feature, employed only when the need for lower speed has become somewhat urgent. BMW argues that this setup makes a car easier to drive and can increase range. I can’t help feeling that it’s unwise to wean yourself off the brake pedal – that it’s probably better simply to instruct people to brake gently whenever possible (perhaps with some kind of helpful haptic feedback through the actual brake pedal). Interestingly, BMW has added a defined coasting setting in the car’s throttle map. If the driver holds the accelerator in a particular position, the car will neither regenerate nor expend energy. Despite the questionable one-pedal quirk, BMW seems to have developed a very tempting prospect for those interested in driving an electric car. The big question that remains is price. BMW has already started describing the i3 as the first premium electric car, and it is fabricated from exotic carbon fibre and expensive aluminium. Whatever the i3’s eventual price point turns out to be – it ain’t going to be cheap.